I know it’s been quiet around here for the past couple of weeks. Between sickness going through our family and taking a family road trip for Spring Break (which unfortunately overlapped with the sickness), I’ve been away from my computer. Sickness or not, you know I’ll get back on track to share our monthly budget update! From the beginning these posts have been some of my favorites. I love going through each of our budget categories to share our wins and fails. I also love hearing from each of you as you share your own progress on your financial goals down in the comments! Some of you are getting so close to being debt-free and others are making huge strides. I’m impressed by your steadiness, chugging along when progress is slower than you’d like and taking on challenges even without much support. YOU are inspiring! Keep up the good work! It’s going to be worth all of your sacrifice! Please keep sharing your progress, whether it’s a lot or a little. This month I again made a video walking you through our actual budget, so you can get a feel for how we manage things. At the end of the video I show you how we set up the budget for April. If you’d rather read or are more interested in the details of each category, you can get all of that below! Okay, onto the numbers from March 2018! Our total income for March was $10,131. Since we live on last month’s income, this is money that we’re waiting to spend in April. If you want a sneak peek into how this money will be allocated, I show you how we budget it at the end of the video above. Attorney Income (Day Job)– $6,309 Mr. SixFiguresUnder has been working full-time as an attorney for the state of California since the fall of 2015. His actual take-home pay was $5,197 but I add back in the cost of the benefits (insurance, dental, vision, parking, union dues and retirement) that are automatically taken out of his check so that you can see what happens to the money that never makes it home. Award Income– $319 My husband received a $500 award at work for being awesome in some way or another. This is what came home after taxes. Attorney Income (Private Practice)– $942 On top of working full-time, my husband has a part-time private law practice on the side. He started it to help speed up our debt payoff and because he had clients from his days at a small firm that didn’t want to let him go. This income fluctuates greatly from month to month. My Income (Blog)– $2,561 The income that I report is the income that I received this month minus all of my blogging expenses. Of this, I’m setting aside 25% for taxes ($640) and distributing $1,921 to the family checking account as my paycheck. Last year I set aside 30% of my blog earnings and it more than covered our tax liability for both of our businesses. Our spending in March came from the income we earned in February Here’s how we spent money in March. Tithing– $875— We happily pay a 10% tithe on our total income from the previous month. You can read more about why we paid tithing, even when we were in debt. Mortgage– $3,200 Our new mortgage payment is just under this amount, but we like to round up to a nice even number. My husband is working on a post with the details of our refinancing, so stay tuned for that. Our first payment isn’t until May 1st, but we still wanted to budget the whole amount. Of this amount $1,269 went toward refinancing costs. The remaining $1,931 will roll over to next month. Our plan is to build up an additional month’s mortgage at the category level (I’ll explain this more in the video for you visual learners). You can read more about why we got a conventional mortgage instead of FHA or USDA and then why we didn’t wait for a 20% down payment. Electricity– $323 Our electric bill is for two households, as our renters are on the same meter. We very rarely use our heater (and our rental uses propane for heat), so this is mostly from the water heater, lights, washer/dryer, fridges, etc. Water– $48 Our water bill comes every other month, so I just set aside approximately half of what I expect the bill to be (or what it is). Internet– $50 After talking to our tax guy, we figured out how to split this expense. We divide this utility based on usage, so 20% to our household, 20% to the rental, and 30% to each of our businesses. But to keep things here simple and relevant, I just put the entire cost. Republic Wireless Cell Phones– $16 We’ve been using Republic Wireless as our cell phone carrier for over three years now. This covers the cost of service for my phone, including all taxes and fees. (We’re on the Republic Refund plan from a few years ago which is no longer available; an equivalent plan for a new user today would be $20/month). My husband also has a Republic phone which he uses for his private practice, but that’s a business expense, not a family budget expense. If your cell phone bill is killing you, I definitely recommend that you check out Republic Wireless! Food– $395 This year I’ve committed to showing you exactly what we spend our food budget on. We spent $330 on our monthly grocery shopping. Aside from this, we spent another $32 at Sam’s Club for food for our trip (bananas, mandarins, spinach, string cheese, milk and raisin bran). I also spent about $20 at the grocery store on our trip home. We didn’t buy any fast food at all. I may have also bought some Easter candy, and some of it may have been diverted to a ‘mom treat’ stash instead of appearing in the kids’ Easter baskets. Gas– $311 Gas around here is at $3.19/gallon. This $311 does not include the gas for our family trip, as total trip expenses are shown below. Clothing– $17 I like making Easter dresses/ties for my kids, but last month I found some matching dresses on clearance. I got matching dresses for my two girls and got a third dress that I will use for fabric to make bow ties for my three boys. I also got leggings for the girls and some earrings for me. Fun– $71 This includes a birthday lunch as a family, half price appetizers from a night I went out with some girl friends, and 2 new karaoke microphones ($10 each) to go with the karaoke machine someone had given to us. I had some other girl friends over for karaoke this month. We also grabbed a $5 box of ice cream sundae cones at the store to celebrate our daughter’s talent show performance at school. Animals– $72 We bought four 40 lb bags of chicken feed and 35 lb cat food. Allowances– $60 Last month we started doing allowances for our kids. I will explain our system and how it’s working in an upcoming post, but if you want a sneak peek, check out the book The Opposite of Spoiled. Kids Activities– $143 We had some wrestling expenses for our older son and some musical theater expenses for our older daughter. Now that we’re done funneling every extra cent toward debt, we are using sinking funds in our budgeting. This is money that we set aside each month into certain categories where it builds up until we need it. Home Projects– $0 We didn’t make any progress on our home projects, so the balance still remains at $1,011. Dental– $30 We have $90 in dental right now. Medical– $100 We had a busy medical month. We had four $15 copays and some prescriptions in March, totalling $74 Our current balance for medical is $341. Car Repair– $300 We spent $56 in March for an oil change and new air filter for the van. The current balance in our car repair fund is $544. Car Registration & Smog– $40 We currently have $64 in this fund. Christmas– $100 We currently have $300 in our Christmas fund. Gifts– $40 In March we had a birthday party with friends for our older daughter. We also bought gifts for her and a child with an April birthday. We spent $96 total. Our current balance is $83. Vacation/Family Reunion– $200 We have a couple of road trips and a family reunion planned for 2018, so we’re designating some dollars to those expenses. We took a road trip for Spring break in March. We spent $446 total. Of that $230 was for gas and $77 was for one night in a motel. We also bought an inexpensive rooftop carrier, a giant tarp, double pie irons, headlamps, and other supplies that we will use over and over again. The food expenses are included in the grocery category. We didn’t buy any fast food or eat out at all on our trip. We currently have $54 left in this category. The total we want to save in 2018 is $26,000 ($15,000 toward our emergency fund and $11,000 to my IRA). Right now we are at $6,878, which is 26% of our goal! Our goal for 2018 is to reach $25,000 in our emergency fund. In March we put $506 (and got a bit of interest too) toward our emergency fund, which makes the current total $11,166. In March we contributed $550 to my IRA. We decided to automate this contribution each month so that by the end of 2018 my IRA will be maxed out. I decided to add an explanation about our rental property to our monthly report since so many of you have had questions about it. I haven’t included it previously because we haven’t been taking a “paycheck” from it yet. We keep the rent money in a separate account and keep the rental transactions separate to make taxes as straight-forward as possible. Of course there are some expenses that are shared such as electricity, garbage, internet, and water. There are other expenses like propane that are solely for the rental. We started renting the unit before we were actually ready to rent it because it was a good fit for someone who needed somewhere to rent right away. It was kind of nice to be “forced” to make the necessary repairs right away rather than on our own time table (because I’m sure we would have put it off). The initial repairs cost us around $4,500 ($3,565 which we paid out of pocket as you can see in June 2017’s budget update) . We planned to save the rent money until we accumulated enough to “pay ourselves back” for the initial repairs and costs. In the future we plan to take a monthly paycheck from the rent, but up to this point the money is just sitting in the bank. We will reimburse ourselves soon. Other costs that have come up, like the $650 cost for removing a tree that was dangerously overhanging the rental, have come directly out of the rental account without going through our budget at all. In 2017 we just charged $500 for rent which includes utilities. In 2018 the rent went up to $700 (something we discussed with our renters from day one). While both of these are below market value for our unit, we are happy to have good people as neighbors. When we were young and newly married, we had kind people who rented to us for below the going rate and it was a great blessing for us. Now we are in a position to do that for someone else. Looking at the report we gave to our tax preparer for 2017, we spent $6,240 on rental expenses and $569 on rental utilities, while we only brought in $3,800 of rent. In other words, our rental cost us $3,000 in 2017. See why I haven’t mentioned any rental income thus far? With the big initial costs out of the way, and the rent price up, we should see a profit in 2018, and this will become a regular category in the budget. The numbers make this look like a bad deal, but it’s really not. Even though we’re not turning a profit yet, the money spent on fixing up the apartment is money invested into our property. We aren’t taking any cash from the rental, but the rent money is being used (aside from the utilities) to fund repairs to the rental property. 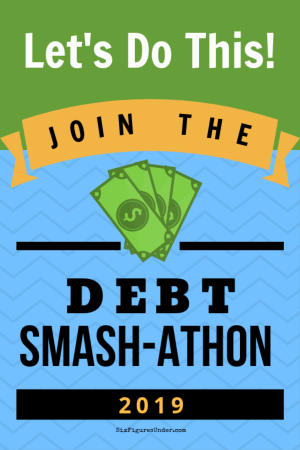 I’d love to hear about how your budget and/or debt repayment went in March! This post contains affiliate/referral links for products and services that we actually use and think are awesome! If you make a purchase through one of my links, I may get a small percentage of the sale even though the price to you is exactly the same. I am so excited for you Tanya!! HUGE Congratulations! The only debt we have mainly is our home. You have inspired me to try to increase my monthly payments. I would love to pay it off early! That’s awesome Jennifer! Paying off your house early would be amazing! I’d been wondering about the rental property for months, so I was glad to see the update today! That cleared up a lot of the questions I had about why it wasn’t included. (It’s also helpful because my husband and I have toyed around with the idea of having a rental someday). We haven’t been making too much progress on our financial goals lately because anything extra is being funneled towards either future hospital bills (I’m expecting) or towards unexpected car repairs, but we are looking to rollover my husband’s old 401k into a Roth this month, though we’ll take a tax hit upfront. I have read your blog for quite sometime and am so proud of how much you have paid off and what you both bring in every month. I have been living paycheck to paycheck for 6 years now. I know I needed to find a better nursing job that paid much better with excellent benefits. Well that dream finally came through this week and with this new job my salary will be doubled!!!!. It is a nationwide company with excellent benefits. My first goal is to pay off 2 CC. Then I want to max out my Roth IRA and contribute 10% into my new retirement fund. We live on very little so I will also start saving for a used car for DD who will be 16 in 2yrs. I want to continue to add to my emergency fund to have 6 mos of living expenses. I also want to splurge on a pedicure for the summer months and some extra’s we have not been able to afford. I am excited to start over and in God’s perfect timing it did happen. Congrats on your new job Laurie! Doubling your salary is an amazing breakthrough! I’m glad you have goals in place, otherwise it’s very easy to let your standard of living inflate instead of making financial progress. Way to go! We don’t have a separate account for our rental income. It makes sense; we just didn’t get around to setting one up. But, my husband’s a CPA, so I figure if he’s happy enough going through and sorting everything out at tax time, that’s fine by me! Our only debt is the mortgage for the rental property. As mortgage payments for investment properties (but not for principal places of residency) are tax-deductible in Australia, it really doesn’t make sense to pay it off early – otherwise, all of the rent is taxed as income – but we make extra payments every month, because it’s such a small mortgage and the interest rate (which is only valid for the first 3 years – it’s hard to get fixed rates for longer than that in Australia) is very good. FWIW for those who are interested in investing in property but can’t or don’t want to buy property directly, Vanguard has a property fund, which allows you to have the diversification of property without the additional expenses or hassles of actually owning property outright. Personally I’m a stock market gal. Direct ownership of property always has added expenses and hassles; things get broken and need to be replaced; tenants fall behind on the rent; etc. But if you find a good fund you can just park your money there and forget about it and let the fund directors do all the worrying for you. I always enjoy your updates Becca! You have so many good insights and it’s fun to hear about things work in Australia. Good job not buying stuff! 🙂 That’s a big temptation of mine too. I like to buy ahead and stock up. It’s hard to pass up a good deal! Until I get to a post on the topic, here’s the short answer. 🙂 The rental space is not IN our house, it’s a separate unit, so there really haven’t been that many challenges. In fact, the benefits are pretty nice too, like when we go out of town, our renters can get the mail and take care of the animals! We were acquainted with the people who rent from us before they moved in, so that helps. It really has been a great experience. Not going to lie, I’m dying to read the Mortgage refinance post! I keep checking back every week or so to see if it’s been posted & I just missed it! I’m glad you’re excited to read it! So am I! 😉 My husband has been so busy that he hasn’t finished it. It should be soon though, like before I post April’s budget update! Sorry it’s taking so much longer than anticipated!